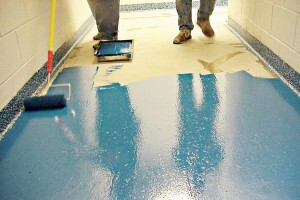 DESCRIPTION: Epoxy Screed is a solvent free highly filled three parts flooring screed. When applied on concrete surface, it gives a high strength flooring & tank lining, capable to withstand extremly high loading, wear and chemical resistance. SURFACE PREPARATION : Successful performance of Epoxy S/L or any other flooring system can achieve only after proper surface preparation. It is the prime requirement, that surface must correctly prepared before application. New concrete or cementations surface must be cured for 28 days. Surface must be fully dry. PRIMER COAT: Apply one coat of Epoxy primer on properly prepared surface by brush and allow it to dry. SCREED APPLICATION: First mix the resin part A, thoroughly with slow speed mixer until uniform color is achieved. Then add curing agent part B and mix again with mixer. After that, add filler par C and mix with mixer until a homogeneous, lumps free mass is achieved. Then, place the mixed mortar evenly. Temp down with beam laid across steel screeding rails of specific height for desired thickness and finish with steel trowel to get smooth finish. STORAGE: All the components Resin, Hardener & Filler must be kept in cool, dry place and in covered shed. HEALTH & SAFETY: It is advisable to wear protective wears at the time of use of Epoxy Screed and all other our products. In case of contact with eyes and skin, wash with plenty of water and consut a doctor. This information, given above in good faith, is based on results gained from experience and tests. However, all recommendations or suggestions are made without guarantee since the conditions of use is beyond our control.